Go on a walk and collect narrow and long leaves that are almost dry. Place on newspaper and spray paint or color with red paint. Let dry. Add a generous amount of white glue in a circle (pic 1) on the green craft paper. 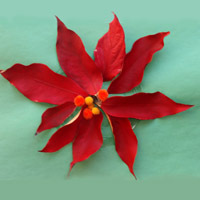 (Simpler solution for small children - adults or older children can add glue to the back of each leaf.) Place the leaves in a circle on the glue. Let dry. When dry glue the yellow pompoms in the middle of the circle. 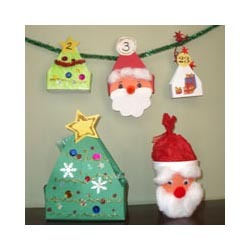 Sing this popular Christmas song with your children with the help of felt story pictures. Or make up new verses to the “12 Days of Christmas” song.